Khartoum — Sudanese police and paramilitary forces have once again fired on peaceful demonstrators in the capital using live ammunition and tear gas. 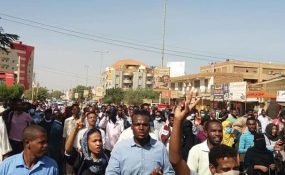 A new mass march organised by the Sudan Professionals Association in Khartoum on Monday, with the intent to proceed to the Presidential Palace to deliver a memorandum to President Omar Al Bashir, was prevented from reaching its objective. A similar march, organised by the Association on December 25, was also violently dispersed, with government sharpshooters allegedly adopting a 'shoot to kill' strategy. According to journalists who spoke to Radio Dabanga, the shooting with live ammunition and heavy tear gas at Monday's procession led to the injury of a number of people. Dozens of professionals including doctors, lawyers, teachers, and politicians were detained. The journalists described the procession as greater than the December 25 march and was characterised by precision of organisation, movement, slogans, and cheers despite the violence by the security forces. Journalists described the march as successful and managed to deliver the message, although the memorandum was not delivered because of unprecedented military deployment, live fire and tear gas. The demonstrators chanted slogans of freedom, peace and justice, and the revolution is the choice of the people, the people want to overthrow the regime, and peaceful against the thieves. A new slogan was added: "You arrogant racist, all the country is Darfur" in a clear reference to the Sudanese rejection of the campaign of the regime against Darfuri students. The centre of Khartoum turned again into military barracks with a heavy deployment of various security forces along the streets leading to the Presidential Palace before the procession. Journalists told Radio Dabanga that El Gandoul roundabout, the site where the march would start, was completely occupied with vehicles of the Central Reserve Police, in addition to a number of armoured vehicles, with an unprecedented spread of security personnel; both uniformed and in plain clothes. Journalists said, the authorities tried to close the bridges to prevent people from reaching Khartoum from Omdurman and Khartoum North. All shops in El Soug El Arabi and around El Ganduol roundabout were closed. CNN correspondent in Khartoum Yousra Elbagir said: "The regime forces fired live bullets at the demonstrators". She said, "There is a heavy security presence in the streets of Khartoum." She said, "I am now wandering around El Gandoul roundabout,", adding that there was no room for taking a breath as security in civilian clothes, numerous military trucks, and trucks mounted with Dushka machine guns are everywhere. Elbagir showed how her shirt was ripped as agents attempted to confiscate her smartphone. El Arabiya television director in Khartoum Saadeldin Hasan said he heard gunshots from inside his office in central Khartoum. The BBC correspondent in Sudan reported that the Sudanese authorities used live bullets against peaceful demonstrators in the centre of the capital Khartoum. Mohamed Osman, the channel's correspondent said: "So far, we have not been told of any casualties, but I have seen some troops firing live bullets to disperse the demonstrators".